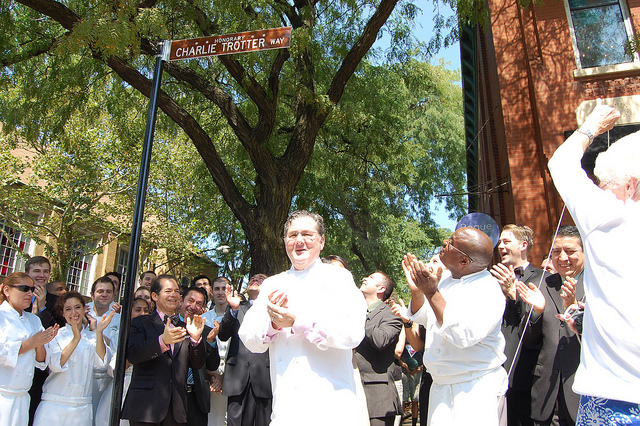 Thursday, Charlie Trotter (the chef) stood under the newly unveiled street sign bearing his name, a few steps west of Charlie Trotter&apos;s (the restaurant), closing tonight after 25 years of international acclaim, to answer a few questions from journalists, including yours truly. Too bad my little interview seemed to go south almost as soon as it had started. "Any other trick questions?" asked Trotter. I&apos;d been asking him about his current school plans, since he first told the Sun-Times&apos; Janet Fuller that he was planning to study philosophy and political theory for a master&apos;s degree. But he&apos;d also said that Trotter&apos;s To Go, his take-out shop, would remain open; it&apos;s since closed. So a lot can happen in nine months. Trotter did say he&apos;d be studying "φιλοσοφία (philosophia)" — and yes, in Greek. As for where, "It&apos;s down to Northwestern or the University of Chicago," he said. And what specifically? "The Greeks versus the Germans," said Trotter — and then he countered with the "trick question" thing. I have to admit that he rattled me, but that should hardly have been a surprise, given his mythically mean reputation: Mark Caro&apos;s three part series in the Tribune includes accounts of Trotter making chefs, including a young Graham Elliot Bowles, cry. 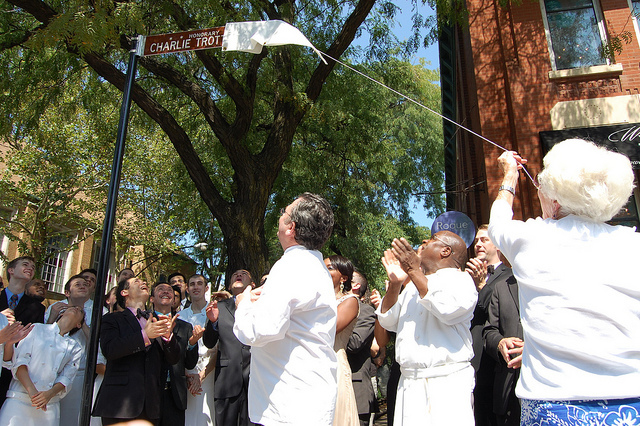 A couple of years ago I got a rare peek at the other Charlie Trotter. Ken Hom — the Chicago-raised, Chinese-American chef sought out by a young Chuck Trotter in California for Chinese cooking lessons — had invited me to dinner at the restaurant. 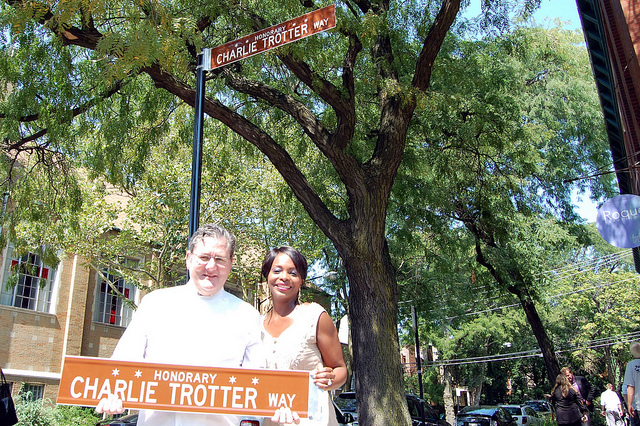 Trotter and his wife, Rochelle, had been hosting a charity dinner in their home, but made it back near the end of the night to sit down together for a few more glasses of legendary wine — and the stories they unlocked. I don&apos;t remember much about the dishes, and as Caro&apos;s series revealed, there really are no signature Trotter dishes, with courses changing constantly. 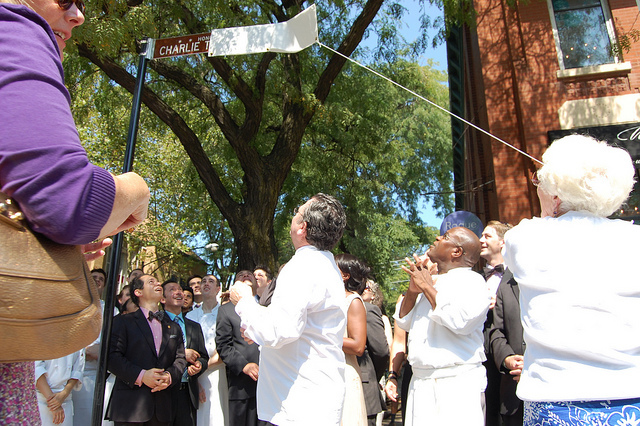 At the street sign unveiling, Rochelle Trotter said the guest who&apos;d dined with them the most had had over 400 meals with them, and not a single course repeated ever. 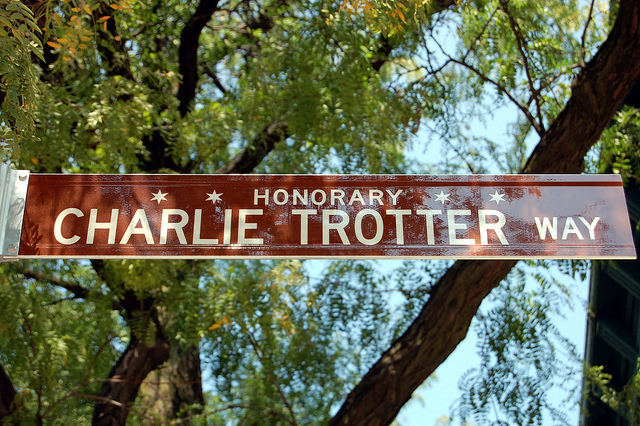 Trotter said after he takes the autumn to close up shop, he plans to take a three-year hiatus to travel (to Buenos Aires, Portugal and Scotland), and earn his master&apos;s. He&apos;d said he plans to open another restaurant, but who really knows? Whatever he does, now is not the end; whatever comes next will be his way.